Watch all live streams and full video replays on the Auto Retail WATCH & DISQUS Page. Log in to your Disqus account to participate in the community forum. Subscribe to our YouTube Channel and press the BELL ICON to be notified when a new event is scheduled or goes live. RSVP on Facebook by marking yourself as interested the event. This is where we announce each and every upcoming event within the series, and where we will includes show notes and links to things we discuss. Guaranteed “Backstage” access to each event within the series, including sessions that are NOT streamed live. With “backstage” access you can participate in any live polls we conduct, and each session’s Q&A. On-demand access to the growing online library of previously recorded sessions. Invitation to join the AutoConversion Influencers and Contributors Group on LinkedIn where you can network and collaborate with other enrolled members. Exclusive invitation to special events, plus discounts on materials and special offers. Did you know that leads generated by employees convert 7 TIMES more frequently than company leads? And according to Forbes Magazine, sales reps who use social media outsell their peers that don’t by 78%. Why is this, and how can your dealership equip its sales staff with the skills, tools, and training they need. Resources they need to effectively utilize social media and generate their own leads, in a way that is synergistic with the dealership and mutually beneficial to the dealership and the employees? These are difficult questions to answer and even more difficult to accomplish, but that doesn’t make these ideas impossible to achieve. 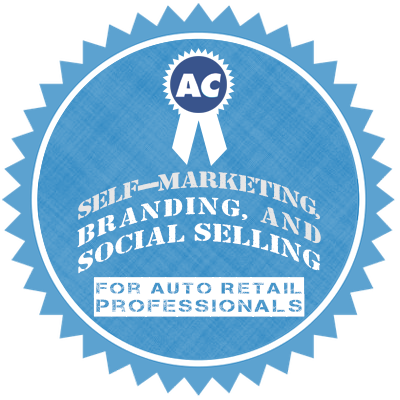 The Self Marketing and Social Selling Series for Auto Retail Professionals is a recurring series of Virtual Web Events that explores people, ideas, and best practices related to the idea of marketing for yourself as an Automotive Sales Professional for an Auto Retailer.